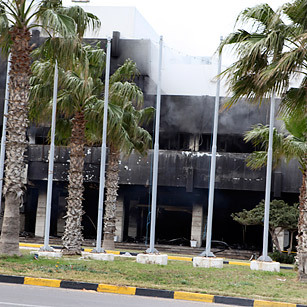 The People's Hall, the main building for government gathering, is burned during demonstrations in Tripoli, Libya. In spite of its rapproachement with the West over the past few years, Libya has always remained the North Korea of the Arab world, its regime as paranoid and closed and prone to unpredictable violence as the Kim dynasty of Pyongyang. And now that the reign of Muammar Gaddafi is imploding, all the totalitarian horrors in his armory  both weapons and propaganda  are being hauled out for open warfare. What was always a kingdom built on fear has become even more so as state-sponsored terrorism rules the streets of Tripoli. Few dare to speak openly, but TIME reached a Libyan in Gaddafi's capital by phone who, for a few minutes, was willing to speak his mind. "Samir," 27, a medical student in Tripoli, says he opposes Gaddafi but that, like many others, he does not dare to venture out into the streets for fear of shoot-on-sight orders, which he believes have been issued to the dictator's militias. "No one is going out today  the only people outside are Gaddafi supporters, who are celebrating. Actually, I have no idea what they're celebrating," he says, using the deadpan black humor he says he developed as a political activist. "Most people of Tripoli are locked away in their homes," Samir continues. "People are scared. There's a shortage of food, but what can you do? Militias have been sent out to roam the streets in cars, and they'll shoot anyone they see walking around. This is what Gaddafi is doing to try and stay in power: kill as many people as he needs to. It's going to be a massacre. It'll either happen in the streets, or they'll come to people's homes. It's going to be a massacre if the international community doesn't step in and do something about it." He replies with no small dose of sarcasm when asked if the militia activity  or people's reaction to it after they had taken to the streets earlier in the week  was in response to Gaddafi's speech on Tuesday night. "I don't know," he says. "I didn't watch the speech, and I don't know if many Libyans did. We've had to listen to this man for 40 years now, and we're sick of it. We know what he's going to say. Or used to. Now he's gotten so insane  so clearly psychotic  that it's gotten more difficult to predict exactly what he'll say. But we know what he'll do, because this is a bloody, murderous regime. In fact, you can't really call it a regime. There is no state, there's no real government. It's more like a mafia family that runs everything using the gangs and armed squads it has put together to enforce its will and attack people who disagree. In fact, I'm putting myself in danger just talking to you, but I have to do it. People have to know what's going on, and just how horrible this man and his allies are. The rest of the world has to know the kind of hell life is for Libyans every day." Samir says that even as the protest movement has grown, there has been increasing "anger at the international community for not doing anything but making speeches. We're getting very angry about that. The worst is Europe  especially Italy  which is now more worried about the threat of mass immigration than it is over seeing even greater numbers of Libyans massacred by Gaddafi in the coming days. That kind of reaction is exactly what Gaddafi wants when he threatens to just let people leave. Why is Europe reacting that way? Why doesn't it back the poor, oppressed Libyan people instead?" Samir is equally emphatic about the warnings now rising  including in a major editorial on Wednesday in France's right-wing Le Figaro  about the popular uprisings in the Arab world being exploited by Islamists who will step in and take over. "I heard this being expressed just last night on the BBC  it's total bulls___!" Samir says. "I'm absolutely secular, as are most Libyans. We've got too many problems to deal with to waste time on religion. How can people imagine societies that are rising up to overthrow bloody dictators would turn around and let oppressive Islamists take over? The idea is more freedom, more liberty, more democracy, not swapping one kind of repression for another." Samir makes it clear that he has stayed on the phone longer than is safe but takes one more question: What does he think will happen now? From the outside, the protesters in Tripoli appeared to be on their heels, leaving the streets to the militias and Gaddafi supporters. But the east of the country seemed to be lost by authorities, and Gaddafi's hold on power in the capital was weakening as more members of the ruling elite threw in the towel  as the Libyan Interior Minister did on Wednesday. "Yes, the east is now entirely free," says Samir, "and Gaddafi won't get it back, so this is very, very good. Now Gaddafi is focusing on Tripoli and surrounding areas. He's using his security forces, militias, his private gangs. There are rumors he's now bringing in more mercenaries from sub-Saharan Africa via Algeria. He's going to try to keep Tripoli  or crush everyone trying. I don't know how it will turn out. When you look to the east, there's hope. But here, right now, there's mostly fear." See pictures of the mass demonstrations in Egypt.